Each of these lights come in only one version, the version seen here. These are new products to Favour, although Favour has many other flashlights already. I do not yet see any pricing on any of these lights. These hosts are fairly nice, but the emitter choice is a really bad almost across the board. Only the T2222 is passable and that one suffers from a pretty bad UI. I did not receive the retail package for these lights, so all I received was the lights themselves. The product descriptions don’t mention what’s included, either. The bright point of these lights is that they are in fact, built rather well. The zoomies are basically variations on a theme. The theme being zoomies, and the variations being the type cell they use. The anodizing is quite good on these lights. They vary from light to light being anodized (AAAx4, AAx2, AAAx2) and unanodized (18650). The 18650 remains unanodized because of the on-board charging, I believe. All can be disassembled by unscrewing the bezel, to access the emitter. The zoomies could really use an emitter swap, too. The emitters rest on a small board, which could cause some challenges with swapping. T2222 is below. Note the inside of the cell tube indicates the direction to input the cells. T2117 is below. Note inside the tube, the contact points for the proprietary cell. That’s what keeps other cells from working. Across the board, every one of these lights is long for what it is. The T2222 has a pocket clip, but ever other of the lights from Favour has only a lanyard. The lanyard was shipped attached, but is easily removable. The lights roll rather easily without the lanyard (and fairly easily with the lanyard). See the table below for specifics on which light uses what cells. 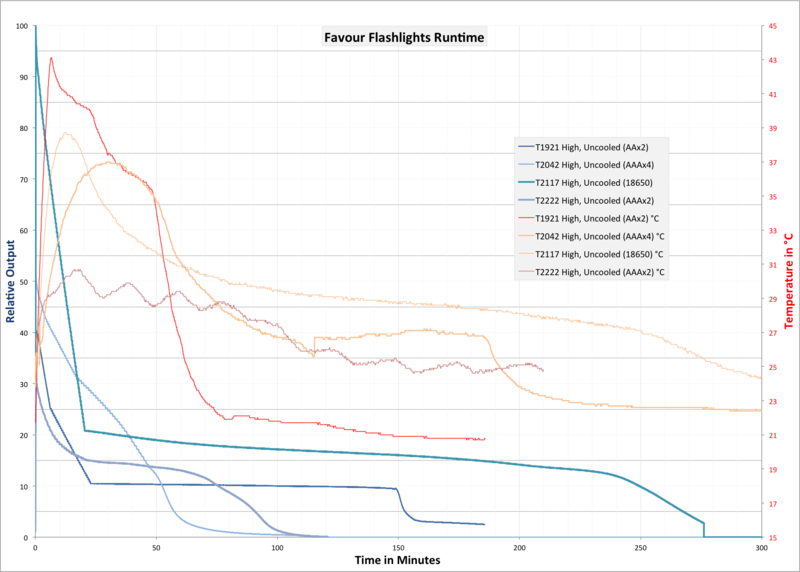 Here’s a runtime, including all 4 lights. I expanded the beginning of the graph, and it shows stepping through the modes. All lights are relative to the brightest one, which is the 18650 version. A note about the 18650 version, the T2117. The T2117 is the only of these lights that has on-board charging. It’s also the only of these lights that ships with a cell. It’s a “2600mAh” cell, and it’s proprietary. And not just that but it’s proprietary in the most frustrating way. First of all, the T2117 can only charge this one specific type of cell. That cell does not seem to be available on Favour-europe.com, so good luck getting a backup. Secondly, the cell can not be charged in an outside charger. This is bad on both counts. (I might be ok with the scenario if the cell was chargeable outside the light. Or if the light charged non-proprietary cells.). Also noteworthy about the T2117 is that it doesn’t work with unprotected cells, or flat top cells. Or even long button tops. Or any other cell I can find that is similar to the FuelBar cell provided. This is an absolute failure in technology, and the worst proprietary setup I’ve seen so far. On-board charging is fairly good, after it seems to get stable. Charging happens at approximately 0.9A. Also from this graph we can see that the advertised capacity of the cell is accurate (or even understated by a hundred mAh or so). The rest of the lights use standard AA or AAA. In my testing, I used Eneloops. Click for on. Click again for next mode: L M H T. Click through the modes for off. Long click reaches strobe mode. Click from strobe for off. Alternatively, if any mode is on for >5s, the next click will be to “off”. The lights will always start in low. I will say the buttons on these lights are quite nice. They are grippy and easy to access, and also recessed enough to allow tailstanding. 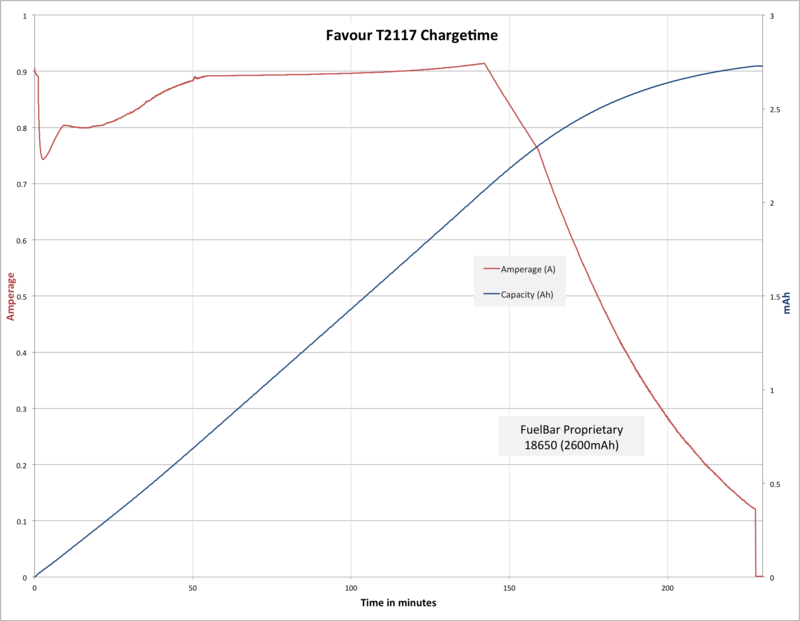 The T2222 is a much simpler UI, but still not all that smart. Click for Low. Click off then on for High. Click for off. That’s it, and it’s that simple. On this light, the switch has momentary, so the mode can be selected without a full click, too. The switch is very proud on the T2222, so no tailstanding here. See the chart below for specifics on lights/emitters. Sorry to say that on every zoomie, the beam is extremely purple. The T2222, which has a “3W LG White LED” has a mostly acceptable tint. It also has a very tight spot, surprising for such a short fat reflector, and domed emitter. The three zoomies are all flood in flood mode, and mostly throw in throw mode. The zoom operates by pulling the head in or out for focus. Unfortunately (but possibly intentionally) the zoom doesn’t focus the beam perfectly, which means the projected beam is a little fuzzy. That’s ok, because it smooths the square out just enough. The optic isn’t quite a normal zoomy optic though. There’s a dome as usual, but the dome is smaller than the whole output area, and the part of the optic nearest the edges goes in the opposite direction. I’d guess this helps with focusing in some way. The zoomies are basically all the same. The T2222, however, has a nicer tint. Build quality is fairly good. Next is the Armytek Elf C2, a light I’ve been carrying for a while now. And so many knives!! This light was provided by Favour-Europe.com for review. I was not paid to write this review.